This post is about how I became a self-loathing iPhone owner, and decided to switch to a device that noone has ever described as “revolutionary”, “amazing” or “magical”. I’ve replaced my iPhone 3GS with a Nokia 2323 Classic. A $70AU ($63US) phone based on eight year old technology. First, the obvious reasons. I’ve been increasingly uncomfortable with Apple’s monoculture. I’ve never liked their closed approach to device ownership. Even though my two iPhones have been jailbroken, I’ve bought apps – contributing money to the App Store economy. I’ve also contributed to Apple’s iPhone bottom line. All rewarding a business model that I don’t agree with at all. Given all this, and my general love of gadgets and technology, you would expect that I would choose an Android phone. One of the more open models. I thought very hard about picking up a Samsung Galaxy S (especially now Cyanogenmod supports it) or even a Nokia N900, the ultimate geek pocket gadget. I don’t like the person that the iPhone encourages me to be. I don’t like reaching for it over and over, checking Twitter or scanning my email boxes with every idle moment. 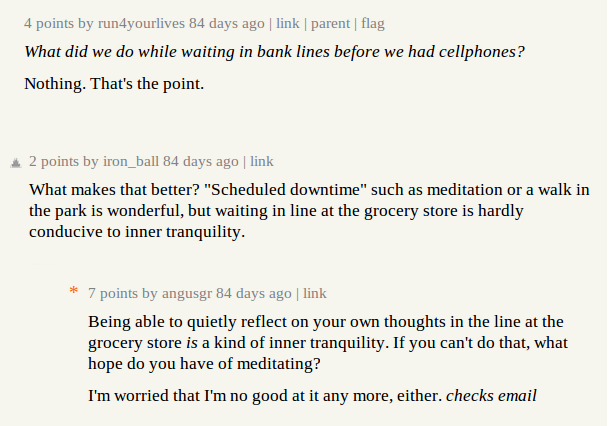 I don’t like how quiet moments of reflection get replaced with boredom that there’s nothing new on the Real Time Web. I don’t like that most days I spend more than ten hours in front of a computer, but I still feel the need to carry one around in my pocket. I don’t like taking my iPhone out during meetings or conversations. I don’t like “the iphone effect”. The underlying assumption is that idleness is necessarily wasteful, and why would anyone want it? Consequently, consuming information is a more fulfilling form of activity than just being inside your own head. I don’t think I agree. Since getting an iPhone I don’t read books nearly as often as I used to. I don’t sit and stare into space quietly, thinking about whatever happens to be on my mind. I don’t pay as much attention to the world around me. I miss all those things. Of course none of this is the iPhone’s fault. Smartphones are just tools, plenty of people don’t have this problem at all. If I had better self control then I’d just curb my use. In my case, I think the problem is smartphone ownership combined with N.A.D.D. (Nerd Attention Deficit Disorder.) An iPhone is like a “New Tab” browser menu, for your life. The Nokia is tiny, and light. It doesn’t need its own reserved pocket in my jeans any more. Sound quality and volume are both better, when you’re actually using it as a phone. Standby time up to 17 days. Days. No more having to charge every night. My muscle memory for typing quickly on T9 keypads is gone, but I think it will come back. Syncing calendars and contacts was not overly painful, even from Linux. Being able to automatically sync via Bluetooth is neat. No more need for phone insurance. Never having to look up an address or a map before leaving the house. Instapaper. Although I don’t use it much now that I don’t have a regular commute. The “Notes” application. Will need to make a habit of carrying a notebook more often. 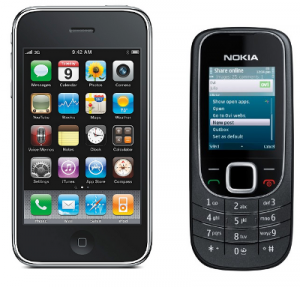 Do I need a mobile (“cell”) phone at all? I think so. Even though I no longer have a job that requires me to be available on-phone at weird hours (another plus for ditching the iPhone), mobile phones are embedded in my generation. My partner, friends, and colleagues would all be put out if I ditched it entirely. Besides, they’re pretty useful devices to have. I’m terming this an experiment because in a month I might decide that I’m an idiot, and I’ll go buy a Galaxy S. Expect a follow up blog post if that’s the case. My partner certainly looked at me in total disbelief when I told her this plan. “Just get the Android one, you’ll be happier that way.” She may well be right. good luck and I’ll be very interested to read the followup! I made a conscious choice a while back to get a phone that was not *smart*. Not for the reasons you describe, but because I didn’t find the functionality of the smartphones (not iphone btw) helpful at all. My only requirement for the phone I bought was that it worked as a phone and supported 3G tethering. I figure why have a smartphone *and* a netbook? I have since bought a Blackberry which does everything you describe above… and now I like it a little bit less… I am now feeling like a happy medium would be a non-smart phone and a netbook with 3G internet. After all you are much less likely to pull out your netbook in a grocery line or even a meeting. Good luck finding a balance Gus …. Thanks for holding up a mirror to my life: I hadn’t previously recognised the condition from which I am apparently suffering. Great article. Good luck and be persistent! Instead of “going back” to simplicity, I’ve managed to maintain it for years now, using only the cheapest Nokia available. For 15GBP/23USD a month, I get unlimited calls and text messages to my friends and family (who all use the same network – O2). The world is a better place without the ball and chain of a “SmartPhone”. The SmartPhone’s sole purpose is to upsell applications, subscriptions, insurance and debt. Mr Required: I’ve been on my cheap Nokia for over 3 months now, I have no plan to go back. I don’t think I’m special, however I do think that smartphone dependence is becoming the norm in many circles. Your statement about what phones are “for” and what computers are “for” is clearly just your own opinion though. There are millions of people now using phones for emails and games, not to mention using computers for making calls. Fifty years ago I’m sure people would have happily told you that telephones are “for” standing in your hallway and that computers are “for” feeding punch cards to do elementary calculations. Great article, Angus. That just made me recall why I still carry around my old “unfancy” Sony Ericsson T700. What I do with my cellular is making phone calls and writing a sms now and then. Standby time still 5 to 7 days, depends on my call behaviour. As nice and high-tech as an iPhone might be compared to my plain mobile phone, I don’t feel the need to do the things you can with it. I’m not into twitter and stuff and i don’t like to play either. Another refreshing “Gus” post. Today, Gus, you are my ShorDurPerSav (Short Duration Personal Savior). I’m also an avowed Dumb Phone user. It’s Plenty Good Enough For Me. My next mobile phone will be the smallest one that I can find, so I can keep it in my jeans pocket without taking affecting my girlish figure. While I will likely always have a cell phone, it is because I cannot see the neccessity (these days) of having a land-line when I can have accessibility in-my-pocket. and LOTS CHEAPER by pay-as-U-go! Do you still have a “dumb phone” now (July 2013)? Sadly not, I bought a cheap Huawei in August 2011 (see “Smartphone Relapse” linked immediately above your comment) and then earlier this year I bought a Nexus 4. I’m back in distraction-land like everyone else.